With the fall season already here, it’s time to check your outdoor wardrobe to make sure you have all the right gear for cool weather hiking. During the fall, winter and spring seasons, it’s usually a good idea to dress in layers, especially when hiking in the mountains. This allows you to easily add or remove clothing as temperatures fluctuate as a result of changes in elevation or changes in weather patterns. 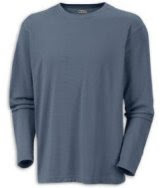 To start off, it’s always a good idea to wear a wicking tee-shirt as a base layer no matter what time of year it is. Wicking tee-shirts are superior to cotton shirts in that they “wick” sweat from your body. As you hike (or perform any other type of physical exertion), your body produces sweat which helps to cool your body as it evaporates from the surface of your skin. Sometimes, however, the volume of sweat you produce is too great for all of it to disperse. Instead, the excess gets soaked up by your clothes. Performance apparel solves this problem by "wicking" sweat away from your body, just like the wick of a candle absorbs liquid and draws it upward. Wicking shirts, made from polyester-blended fabrics, pulls perspiration away from the skin and pushes it through the clothing's surface where it evaporates. The result is a comfortable, dry hiker. Even in cold weather your body will sweat during heavy exertion, such as when you’re climbing elevation during a hike. In fact, it’s even more important to keep your body dry while hiking in cool or cold weather. If you have to stop, or if there’s an emergency, a wet cotton shirt on your body can be uncomfortable, or possibly even lead to hypothermia. I’ve been wearing wicking shirts for many years now. More than a year ago I purchased an Omni-Dry Mountain Tech T-shirt from Columbia Sportswear and have had the opportunity to use it on many occasions. 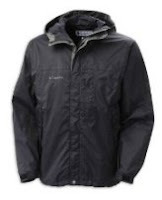 I have worn it in both warm and cold weather and I can say it has done an excellent job of keeping me dry. In addition to wicking sweat away, the shirt has UPF-15 rated sun protection and resists the build-up of odor causing bacteria. Another important item you need to have on the trail is a rain jacket that will keep out both wind and water. Again, this is something you should wear, or have in your backpack throughout the year. Several months ago I purchased the Columbia Sportswear Thunderstorm Jacket. So far, I’ve only had one chance to wear it. It did, however, receive a fairly good test on that one occasion. I was hiking in the Flattops Wilderness Area in Colorado this summer when we got stuck in a surprise thunderstorm which forced us to hike four miles in steady to heavy rain. My upper body remained completely dry and I never felt chilled from the cool breeze. I was very pleased with the performance of this product and was happy that I made the upgrade from a competitor product. The Thunderstorm Jacket is a waterproof, breathable jacket which also resists internal condensation to keep you dry in any conditions. The Omni-Tech technology provides premium waterproof/breathable protection by using microporous membranes which keeps water from penetrating the fabric, yet allows perspiration to escape. Columbia also seals all seams on the jacket. With a wicking tee-shirt as a base layer, and a rain jacket to keep the elements out, you should be properly set-up for early fall season hiking. But as the season progresses you’re going to need an additional layer to keep you warm. Unless it’s brutally cold, you’re probably only going to need a light-weight fleece jacket, or even a fleece vest for mid-to-late autumn hiking. 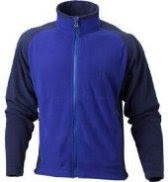 In addition to providing insulation from cold weather, fleece is also very effective at wicking away moisture, not to mention it’s breathable, durable, soft and comfortable to wear. A good light-weight fleece jacket option for this time of year is the Marmot Reactor Fleece Jacket. It’s a 100-weight Polartec fleece with a full-length zipper, making it easy to add or remove depending on weather conditions. The jacket also has insulated pockets to keep your hands warm. If you’re looking for a vest, check out the TAIGA Thermal-Pro Vest. It’s made from light and water-repellent Polartec THERMAL-PRO 'Shearling' fleece. The vest has three zippered pockets and two inner pouches. Finally, you may need a few apparel items, such as socks, hat and gloves, to help keep you dry and warm. Winter gloves and socks are probably going to be too bulky and will provide too much warmth during the fall season. Check out the Thorlo Coolmax Light Hiker Crew Sock or Under Armour Liner Gloves as light-weight alternatives for keeping your extremities warm during the fall. If you need to keep your top warm, pull on the Outdoor Research Diamond Beanie. This is a 100% acrylic, medium-gauge knit hat that will keep your noggin warm without causing your head to suffocate. For more in-depth information on any of the products discussed in this article, or to see the full selection of all our hiking gear, please visit the Smoky Mountain Day Hikers Store.